Manufacturing the world's most advanced inflatable, all fabric, all weather pop-up hangars. 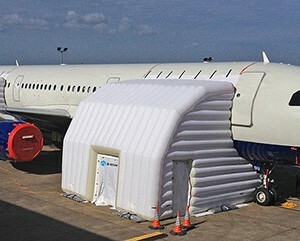 We carry a range of standard size inflatable aircraft shelters for mainstream aircraft. We can quickly, plan, build and design a custom inflatable aircraft shelter to suit your individual needs. 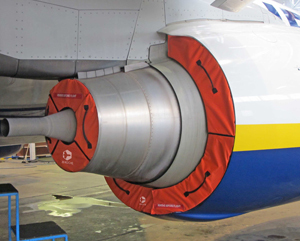 We marry fabric and air to create a range of other, innovative aircraft solutions. Many of our standard inflatable shelters are available off the shelf. In the event of an AOG and an urgent requirement, we will be happy to take your call outside hours to facilitate your needs. Two people can assemble our inflatable maintenance shelter in 15 minutes. Some larger shelters may take 4 people. No training required. Designed and constructed to encapsulate and seal the work area. Fits hand in glove. Hi tech fabrics and design, to withstand the harshest weather conditions. You no longer have to be concerned about severe cold, intense heat, relentless rain, driving snow or dust. Our fabrics are woven and coated to our proprietary design, exhibiting extremely high strength to weight ratios. 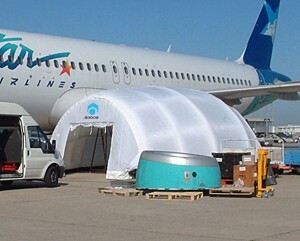 Your aircrafts are 100% safe when encapsulated by our inflatable emergency shelter. Collapses into a small container on wheels that one person can wheel around. Easy to transport, easy to store. We used your inflatable shelter for the first time under harsh conditions and guess what? The mechanics loved it! We changed a HMU at yes -19°C (minus 19 degrees Centigrade) and snowfall during a full night shift. The overall product is great and the guys enjoyed working in a nice warm environment when it was 4° Fahrenheit. It is a great product.